Inspecting and supervising installations of our perimeter security systems is not always a straight forward task because many of our security clients have their operational sites thousands of miles from our Head Office here in Scotland. Distance, however, is not necessarily a problem as our Technical Director Andy Moon is often overseas in discussions with new clients as well as visiting existing ones and quoting for expansion of perimeter security coverage. 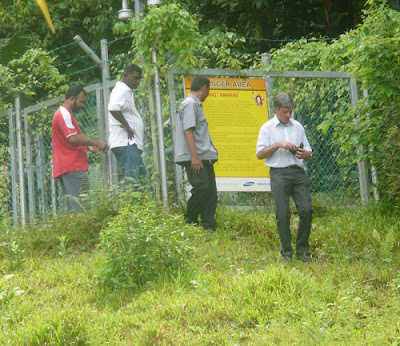 Here Andy is photographed during a site inspection in the Far East where a client wanted to install our Electro-Fence™ system to keep monkeys and intruders out of a gated community. Perimeter protection of homes in gated communities is an ideal application of our Electro-Fence™ system.